This year, Poets of the Fall, the band behind Alan Wake's Old Gods of Asgard, is celebrating their fifteenth anniversary. Even before Alan Wake, the band had a close relationship with Remedy. The group's first song, Late Goodbye, became Max Payne II's theme song. Written soon after the group had formed, it became a staple of the game. Numerous references to it could be heard throughout the levels but in the climax of the story, the credits descended to guitar strings, the first glimpse into what the band could achieve. It wasn't until 2005 that their first album, Signs of Life including the Late Goodbye single, was released and very quickly climbed the charts to reach platinum in Finland. The group's relationship continued with the Alan Wake series as they adopted their alter-ego, Old Gods of Asgard, creating brilliant songs such as Children of the Elder God, The Poet and the Muse, and Balance Slays the Demon. Two additional songs were included in the game credited to the Poets, The Happy Song (from the album, Jealous Gods) and War (from the album Twilight Theater). Despite similarities between War and Alan Wake, the two were created separately but fit so perfectly together that in mid-2010, just months after the album and game was released, the music video of War was uploaded, a collaboration between Poets and Remedy. As fans of the band and to celebrate fifteen years of Poets of the Fall, we spoke to Akseli Tuomivaara, the Director of War to learn more about how the video came to be. And here’s a new song from a band that -- they always remind me of our local rock legends, the Old Gods. I couldn’t tell you why, I guess it’s just -- you know, one of those things. Anyway, here’s Poets of the Fall and their latest single, “War". Prior to War, a number of the band's music videos were directed by Alan Wake's Cinematic Director, Stobe Harju. It was through networking that Akseli's name had been put forward for the role, along with co-director Aleksi Koskinen, "I hadn't worked previously with Poets of the Fall. I believe I was recommended by Stobe Harju, the guy who directed many of their previous promos (Carnival of Rust etc.). Stobe was busy directing in-game video material for Alan Wake, so he couldn't make the video." He also added that personal connections didn't hurt either, "I'm also a cousin of Petri Järvilehto, one of the founders of Remedy - not sure, if that had something to do with them contacting me about the gig. :)"
Photo by Tiia Öhman. Used with permission. From the start, the music video was approached as a crossover with the Alan Wake series. When Akseli joined the project, Remedy took him on a studio tour and introduced him to the game ahead of planning "[The] best part of making this video was to get a private tour in Remedy and seeing the game before it's release. Based on that I wrote a loose [first] draft of the script. To be honest the script was just a bunch of random scenes trying to mimic the mood of the game." As preparation work went forward on the music video, Akseli listened to War on repeat to make sure the shots captured the same atmosphere. "The lyrics and the mood of the song naturally had a huge impact on everything." The main issue moving forward was the budget and the scope of the project. "Creative decisions were all limited by the budget (very small). We had to shoot in Finland and with a tiny crew, so I was a bit worried how are we going to pull of the mood of Bright Falls. Thankfully we had the actor Ilkka Villi (who plays Alan Wake also in the game) with us. Remedy games are so character driven that I knew we could achieve something cool for the fans just by shooting Ilkka doing his act in the middle of a some random forest." Careful considerations were made to capture both the feel of the music and of the game. 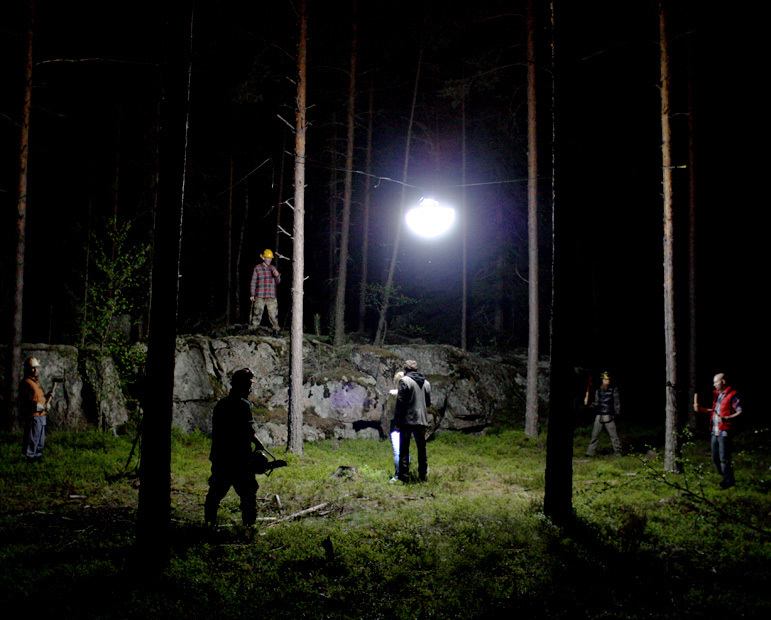 Locations were selected in the Finnish countryside, just a thirty minute drive from Helsinki where filming would span a full two days to capture as much footage as possible in shifting conditions. 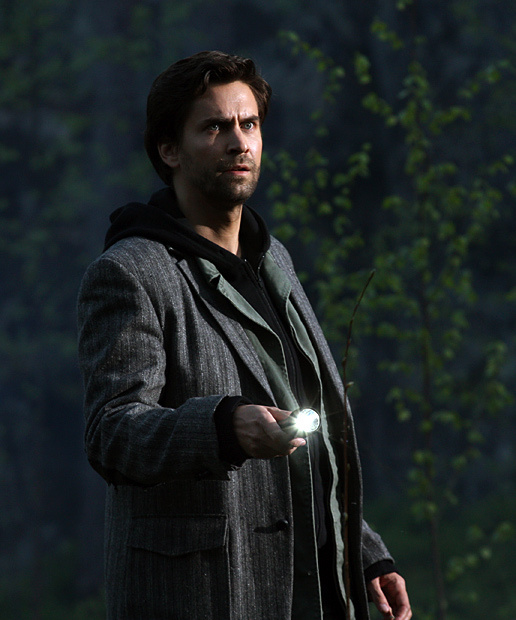 "Constant changing of the moods by lighting (from night to day, dream world to real world...) is a big part of Alan Wake. So we naturally wanted to use that in the video as well." The daytime scenes were used to film the scenes on the field with Alice and Alan, the adventures through the forest, and the music video's opening. "Things never go by the plan, but with this one we mostly had a good luck with the weather and the locations," Akseli comments. In the game, there's an emphasis on cyclical events such as the repeated events at Bird Leg Cabin. In the music video that similar pattern can be seen especially with the start and end being a repeat of the same shot; of Alan emerging from the forest as a truck rolls by. "In the script (I believe) the beginning of the video was something different. Using the same scene twice this way is quite an old trick, but who cares if it works." That specific shot of the truck rolling past has an interesting history, as it was one of the few shots that Remedy asked to be changed. “In the original version of the last scene we show that the lumberjacks (played by the band members) have kidnapped Alan Wake's wife, Alice, and are holding her down in the back of pick-up truck. But the guys at Remedy asked us to edit it differently, because it contradicted the narrative of the game too much. Besides that I can't remember any major changes from Remedy's behalf." 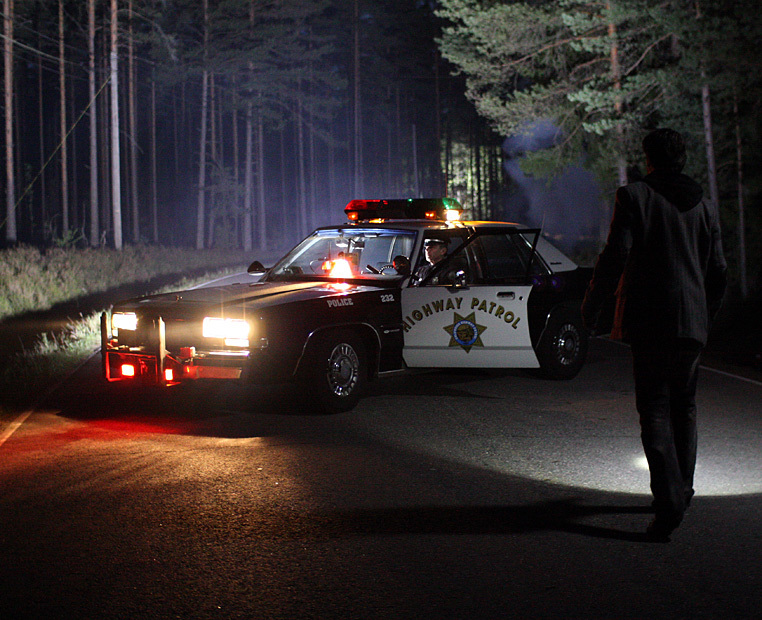 With the sun setting behind the forest, filming began on the impressive police car scene. On his travels, Alan stumbles across a police car jutting across both lanes, just metres away from roadkill. The driver is looking emotionless and still even as he approaches. Taking his eyes off the driver for a second or two, Alan returns to the seat and discovers the officer has disappeared, a scene atmospherically similar to the climax of the Bright Falls TV show. The shot was fairly spontaneous and one of Akseli's personal favourites to shoot. "My favourite moments include all the crazy improvisation we managed to pull off during the shoot. For example the scene with the police car was added very late when we found out there was a replica of an American police car available nearby. In the same scene also the roadkill fox was added on location using a fox fur from the wardrobe and some jam (as blood) from the catering." The music video was released on the 9th of June 2010 and was uploaded to both Poets of the Fall’s and Remedy’s YouTube channels, to a very positive reception. "The moment that made me proud was reading trough all the (mostly) positive feedback from the fans of Alan Wake and POTF." In post production, additional work was done to make the Helsinki horizon resemble that of Bright Falls. "What made me especially happy was the comments by some fans in the US, who thought the video was shot in the same epic locations as the Bright Falls TV-series. In reality everything was shot just thirty minute ride from Helsinki and I added the mountains digitally by myself in the post production." In the eight years since the music video was launched, it's accrued 5.1 million views across both channels. With the shoot lasting two days on a tight budget, a question I wondered about was how would the music video have been different with a larger budget and a longer shoot time. "If we had the budget I would have loved to really do justice for the visually stunning world of the game - camera flying on top of mountains and rivers, weather changing in the middle of the shot etc. On the other hand I'm quite happy with the video the way it is. With the tiny budget we were kind of forced to be do things in an original way instead of trying to copycat the game. After all it's just a music video, not a game commercial. ;)"
The future looks busy. Poets of the Fall will release their upcoming album, Ultraviolet, on the 5th of October 2018 with an international tour in the following months. For Remedy, they are set to release their upcoming title Control in 2019 with publisher 505Games. As for Akseli, he’s in a similar position: "Currently I'm working a feature film project I hope to shoot in 2019. I have two small sons which is also keeping me busy!" A big thank you to Akseli for the interview! To follow his upcoming projects, check out his website, HERE.